Brighton & Hove Albion's Anthony Knockaert. Picture by PW Sporting Photography. BBC pundit Dion Dublin felt Anthony Knockaert's challenge, which earned him a red card during Albion's 5-0 loss against Bournemouth, 'could have been career-ending' for the Cherries' Adam Smith. The Frenchman was given a straight red after an awful lunge on the Bournemouth defender on 67 minutes. 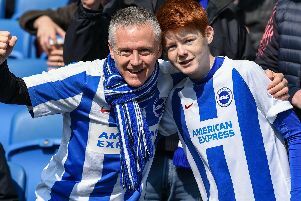 The Seagulls were already 2-0 down at this point, and any hope of an Albion fightback was extinguished after Knockaert's sending off. Speaking on the BBC Sport website, Dublin said: "I have no idea what Anthony Knockaert is thinking. He is a second-and-a-half late. "It's a disgusting challenge and it could have been a career-ending tackle." 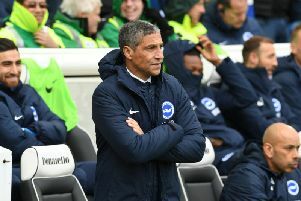 Seagulls boss Chris Hughton ignored the winger as he made his way down the tunnel and the Albion manager labelled Knockaert's tackle 'reckless' and 'emotional'. On the incident he added: "There's no doubt I've seen far worse challenges but what I will accept is that it's a reckless, emotional challenge. "When things are not going well for you it can be an emotional game but as a group of players you have to deal with it. "As a team we didn't deal with it and Anthony didn't deal with it well enough and he was rightly given a red card." However, Bournemouth manager Eddie Howe felt the the lunge from Knockaert looked worse than it actually was. He said: "It was a late challenge but I don't think Anthony has meant to hurt Adam. "He's just gone in late and Adam's momentum has made the tackle look worse than it was meant to be. "Thankfully, from the tackle, Adam has got up and he seems fine."